You are the current highest bidder! To be sure to win, come back on Aug 16, 2017 12:39 EDT (17:39 BST) Date Format as the lot closes or increase your max bid. S/N: 2B15 S10210, SWING: 60", MAXIMUM SWING: 64.5", STROKE: 16", MAXIMUM TRAVERSE STROKE: 21", WORK HEAD R.P.M: 15,25,35,50 RPM, WORK HEAD SWIVEL ADJUSTMENT: UP TO 90 DEGREES, MAXIMUM INCLUDING ANGLE WHICH CAN BE GROUND WITH FULL 60" SWING: 60 DEGREES, WORKHEAD CAN BE ADJUSTED LENGTH WISE SO THAT MINIMUM DISTANCE FROM WORK HEAD SPINDLE FLANGE TO FORWARD POSITION OF WHEEL, SLIDE IS 21" AND MAXIMUM DISTANCE IS 44"., CROSS ADJUSTMENT OF WORK HEAD (FORWARD) : 16", CROSS ADJUSTMENT OF WORK HEAD (REAR) : 14"WHEEL HEAD CROSS TRAVEL : 8", WORK HEAD MOTOR: ( 4-SPEED GEAR REDUCTION ) 2.5 - 7.5 HP., GRINDING SADDLE MOTOR: 25 HP., 1750 RPM., 220/440V., 3/60, HYDRAULIC PUMP MOTOR: 2 HP., ESTIMATED NET WEIGHT: 24,000 LBS. 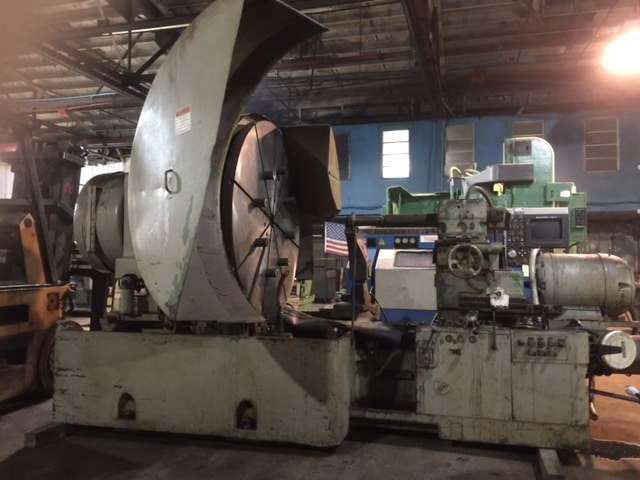 EQUIPPED WITH: 60" "T" SLOTTED FACE PLATE (3" THICK), 48" 6-JAW MORTON INDEPENDANT CHUCK WITH SOFT SOLID REVERSIBLE TOP JAWS , 9" THRU-HOLE IN WORK HEAD SPINDLE, INTERNAL GRINDING SPINDLE ( 16" QUILL LENGTH WITH INSTALLED 11" LENGTH QUILL EXTENSION TOTAL: 28", ADJUSTABLE TRIP DOGS FOR GRINDING SPINDLE SADDLE MAN./AUTO CYCLES, SINGLE POINT (HAND TYPE) REAR ADJUSTABLE TABLE DRESSER, SEPERATE HYDRAULIC UNIT, SEPERATE ELECTRIC CONTROL PANEL, SEPERATE (BAFFLE TYPE) COOLANT TANK & PUMP., EXTRA CHUCK JAWS ( SOFT & HARD ), AUTOMATIC WAY LUBRICATION FACTORY INSTALLED WORKHEAD CHUCK GUARD ( HINGE TYPE FOR QUICK & EASY ACCESS ) CONDITION: VERY GOOD( AS PURCHASED FROM RUNNING SERVICE AT U.S.A. END USER PLANT #3) NOTE: THIS MACHINE IS A VERY RARE EXTRA LARGE CAPACITY HORIZONTAL DESIGN HYDRAULIC I.D. GRINDER AND SHOWS LOW USE ON ALL SQUARE BLOCK WAY AND WAY BEARING SURFACES.